(CNSNews.com) - The United States added 24,000 manufacturing jobs in April and employment in manufacturing has now increased 304,000 since December 2016, the last month before President Donald Trump took office, according to data released today by the Bureau of Labor Statistics. 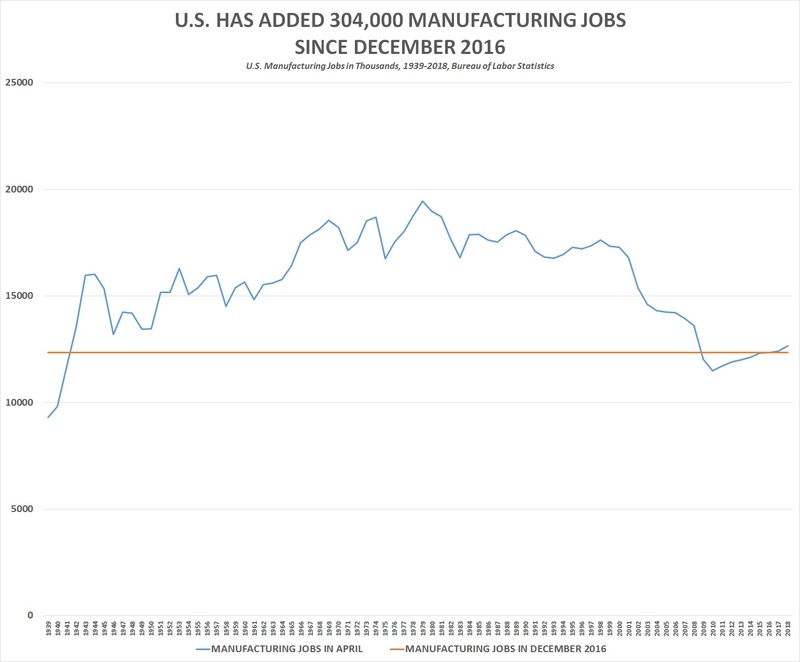 In December 2016, the last month before Trump was inaugurated, there were 12,351,000 manufacturing jobs in the United States. In April, there were 12,655,000. The last time there were more than 12,655,000 manufacturing jobs in the United States was December 2008, when there were 12,850,000. That was the month before President Barack Obama was inaugurated. In January 2009, the month Obama entered office, manufacturing jobs declined to 12,561,000—a one-month decline of 289,000. Manufacturing jobs peaked in the United States in June 1979, when they hit 19,553,000, according to BLS. The most manufacturing jobs in any April, according to BLS, was the 19,450,000 manufacturing jobs the United States maintained in April 1979. The 12,655,000 manufacturing jobs in the United States in April 2018 was 6,898,000 less than the peak manufacturing employment (19,533,000) of June 1979.